What Day Of The Week Was January 12? 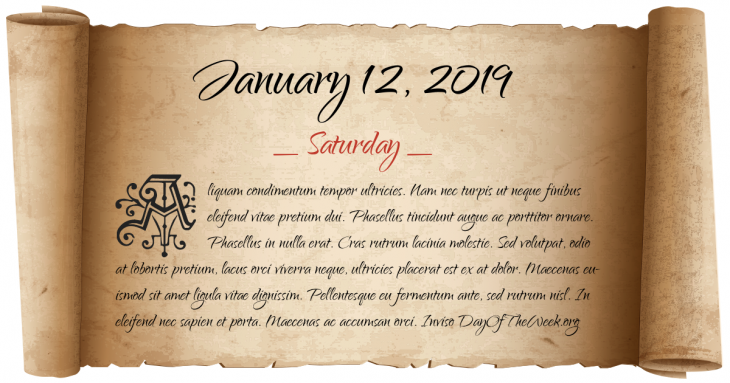 January 12, 2019 was the 12th day of the year 2019 in the Gregorian calendar. There were 353 days remaining until the end of the year. The day of the week was Saturday. Gustav I of Sweden crowned king of Sweden. The Palermo rising takes place in Sicily against the Bourbon kingdom of the Two Sicilies. Sir Henry Campbell-Bannerman’s cabinet (which included amongst its members H. H. Asquith, David Lloyd George, and Winston Churchill) embarks on sweeping social reforms after a Liberal landslide in the British general election. Rebels in Zanzibar begin a revolt known as the Zanzibar Revolution and proclaim a republic. The UN Security Council votes 11-1 to allow the Palestine Liberation Organization to participate in a Security Council debate (without voting rights). Gulf War: An act of the U.S. Congress authorizes the use of military force to drive Iraq out of Kuwait. Downtown Disney opens to the public as part of the Disneyland Resort in Anaheim, California. Deep Impact launches from Cape Canaveral on a Delta 2 rocket. Who were born on January 12?